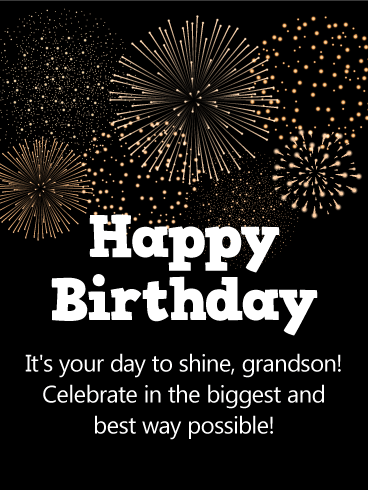 Brilliant gold balloons will have a special grandson in your life floating on air as he celebrates his birthday this year! 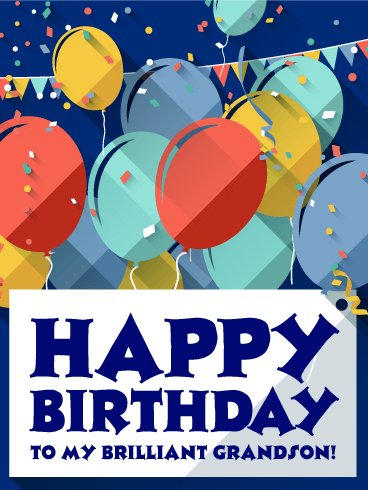 With a deep blue background, this birthday card has a classic design, making it perfect for any age. What really stands out is the sentimental message: "May all your wishes come true. Nobody deserves it more than you." 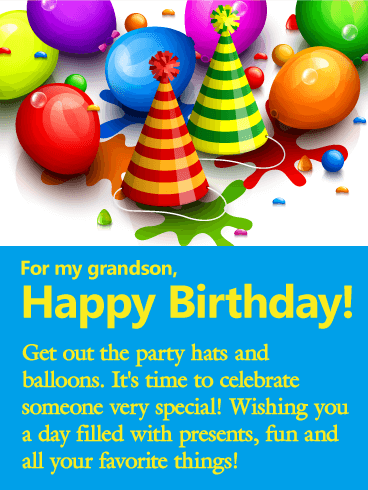 Brightly colored balloons bring a fun and festive touch to this birthday card for a special grandson in your life! Whether he's young, or young at heart, he'll appreciate your thoughtfulness as you wish him a celebration he'll "never ever forget!" 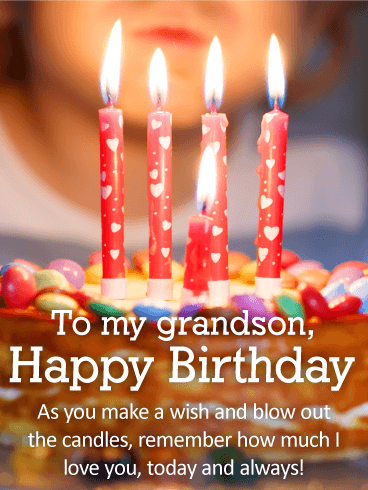 This funny birthday card is sure to be your grandson's favorite! An adorable pooch is all set to party, with his colorful hat and cupcake, complete with a candle. 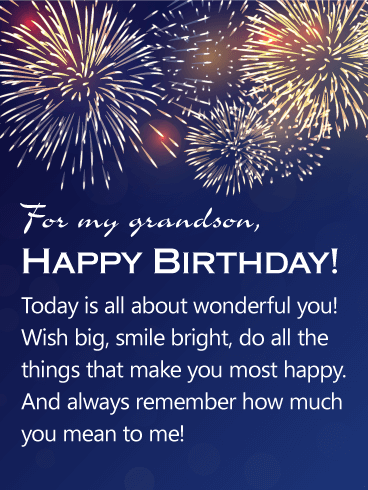 No matter how young or old he is, you can guarantee he'll be smiling when he reads this sweet greeting, knowing you're wishing him all the best on his big day! There's something so magical about this birthday card. 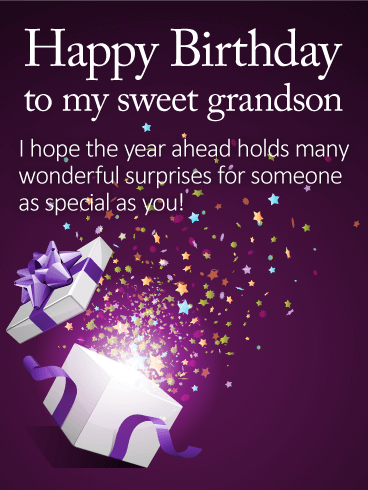 Maybe it's the trail of colorful stars bursting out of a beautifully wrapped present, representing all the wonderful surprises in store for your wonderful grandson in the year ahead. Or maybe it's because as soon as he sees this one-of-a-kind greeting, he'll know it came from you...which is the best gift of all! Get out the party hats and confetti. 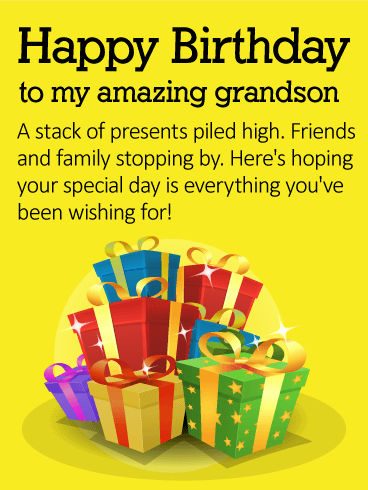 It's time to celebrate your awesome grandson on his birthday! 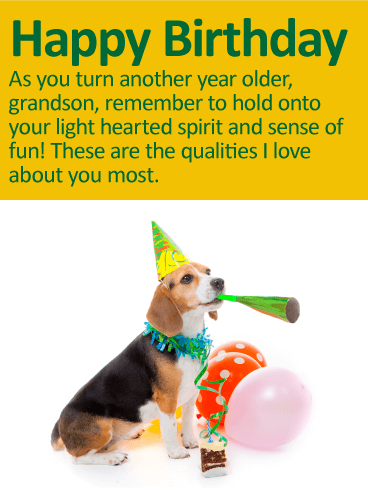 This bright, festive birthday card is perfect for any age. The message may be short and sweet, but it comes straight from the heart, which is something he'll remember always. 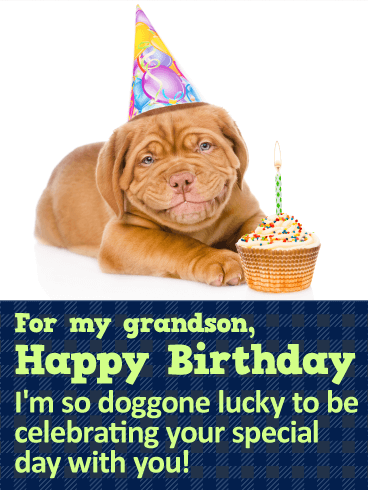 With balloons, party hat and horn, this party pooch is ready to help you celebrate your grandson on his birthday! This fun birthday card also comes with an important message. It's a reminder to him that no matter how old he gets, he should always hold onto his lighthearted spirit, as it's one of the qualities you love about him most. 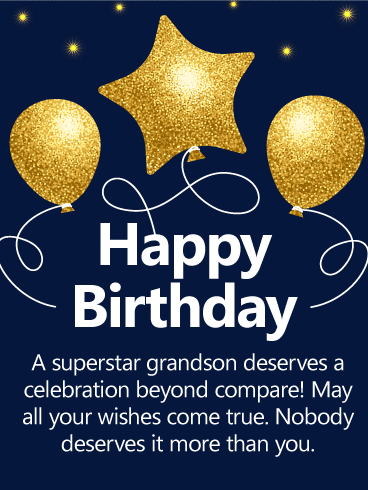 An amazing grandson like yours deserves to be celebrated on his birthday...and this birthday card is the perfect choice! A cheerful yellow background and festive, colorful gifts create a fun backdrop for his big day. 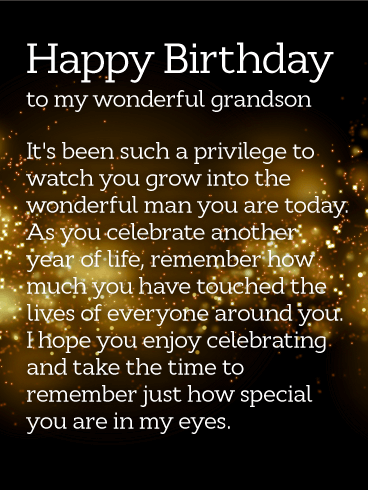 Birthday boys of every age will appreciate the warm wishes and most importantly, knowing you took the time to reach out and let him know he's on your mind and in your heart. 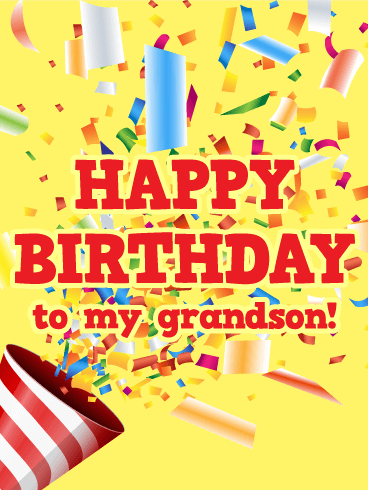 This sweet birthday card for an even sweeter grandson will put him in the mood for a party! 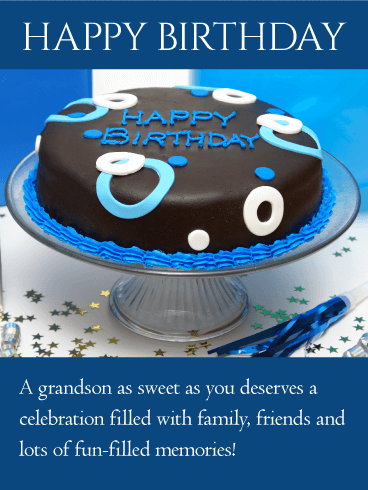 A delicious-looking cake, decorated and served up just for him sits above a special wish from you, letting him know he "deserves a celebration filled with family, friends and lots of fun-filled memories." What a wonderful way to remind your grandson just how much you love him. Birthdays are for making wishes…and for wishing the ones we love another year of health and happiness. 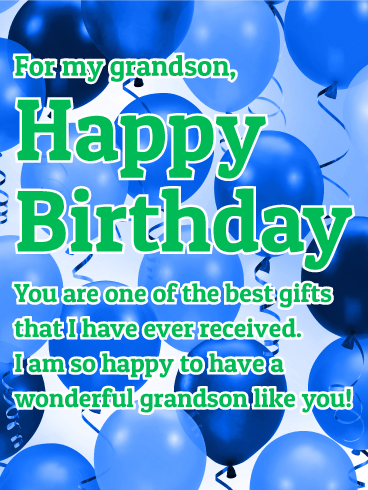 This sweet birthday card is the perfect way to let your special grandson know how much you love him. A young boy sits ready to blow out his candles and enjoy a piece of delicious cake, creating a moment of excitement and anticipation. 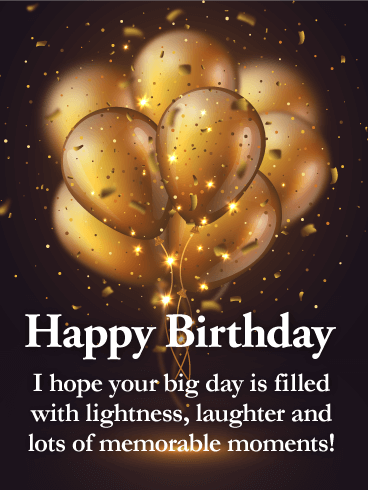 Whether your own birthday boy is still little or all grown up and feeling sentimental, this birthday card is sure to bring a bright smile to his face. 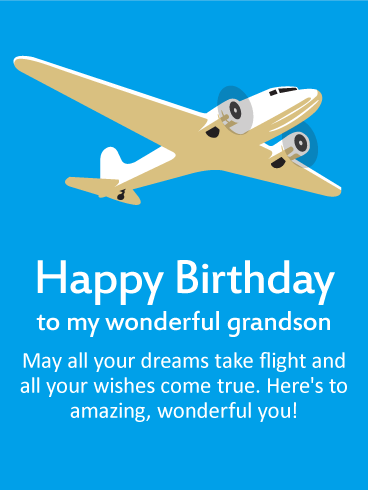 The sky's the limit for your grandson on his birthday when you send this special birthday card! When he reads the touching message, he's bound to have a day full of big fun and even bigger wishes and dreams. Whether you're close by or celebrating him from miles away, this unique birthday card will have him looking forward to life's many adventures in the year ahead! 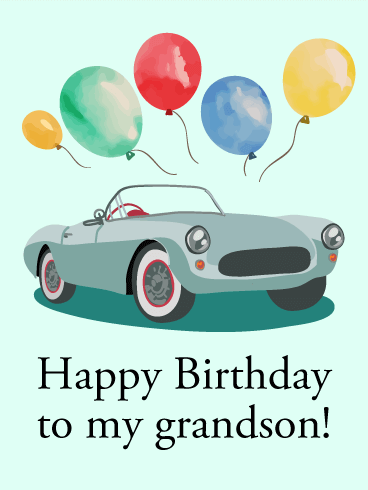 No matter how old your grandson is, he'll appreciate this cool birthday card, featuring a classic car and colorful balloons for an extra festive touch! What better way to tell the awesome guy in your life that you're wishing him well and hoping this year's celebration is the best one yet! 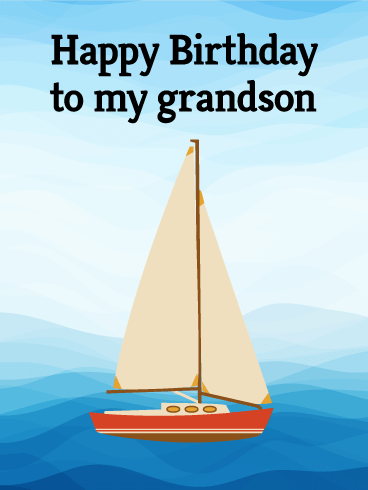 Watercolor waves surround a sailboat, cruising along to help you wish your grandson a very happy birthday! This charming birthday card is the perfect way to celebrate him, no matter how many candles he's blowing out on his cake. It's a reminder that the year ahead will bring many exciting adventures his way! A night sky full of golden fireworks sets the perfect tone for a birthday celebration! 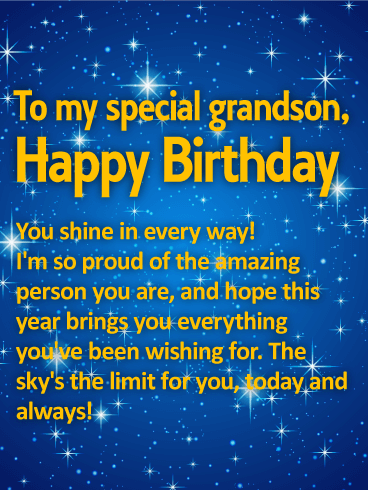 Let your grandson know it's his time to shine today "in the biggest and best way possible!" Whether it's a huge party with family and friends or sitting back and relaxing surrounded by just a few close people he loves, this birthday card is sure to make this year's birthday one he'll never forget! 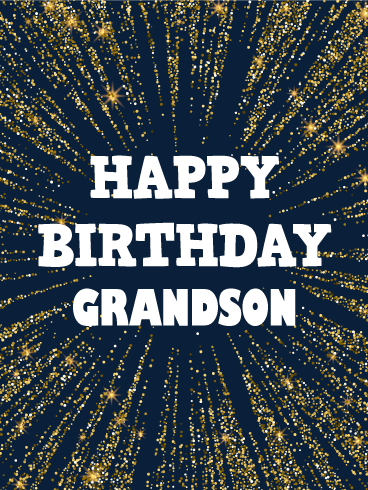 Fireworks brightly burst above, all to celebrate your wonderful grandson on his special birthday! He deserves to feel loved and remembered as he turns another year older, and to be reminded of how much he means to the people in his life, especially you. This birthday card is the perfect choice for any age, letting you reveal exactly how you feel with a touching, heartfelt message. 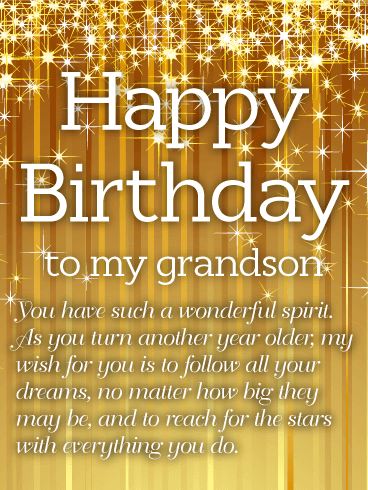 This sleek and sophisticated birthday card will make your grandson feel loved and remembered on his birthday. Golden balloons float above against a rich, dark background. And right in front is your special message to him: a wish for an unforgettable celebration. Because nobody deserves it more! This birthday card has fun written all over it! From the brightly colored balloons to the festive party hats, it makes a sweet surprise for even your youngest little grandson! The message is just as lighthearted, bringing lots of wishes for a day filled with all his favorite things. What a wonderful way to show you care! Cars! There is no relationship like the one a grandparent and grandchild form. 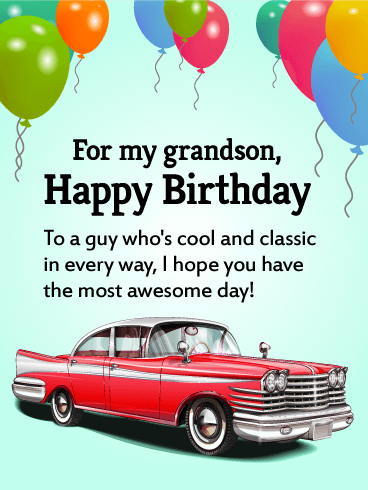 Let your grandson who loves his cars know you are thinking of him on their special day with this unique birthday card. 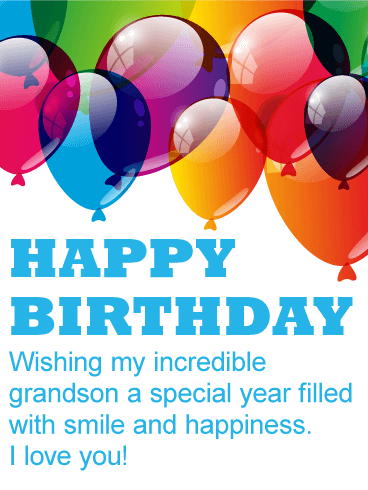 Send this card today and put a big smile on your special grandson's face! Love! There is nothing that will make your grandson smile more than you telling him you love him on his day to shine. Send him this love filled birthday card decorated with colorful balloons to make sure you contribute to his day being special! 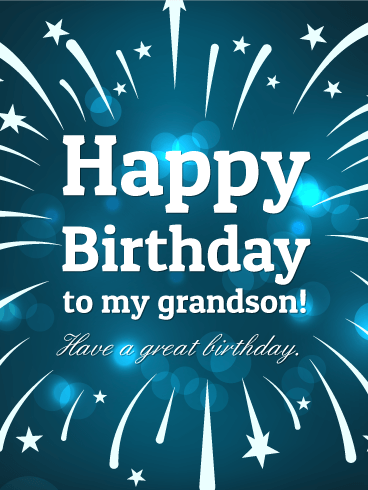 There is nothing that will make your grandson happier than you letting him know just how special he is to you on his birthday. Let him know with these wonderful blue balloons and thoughtful words. 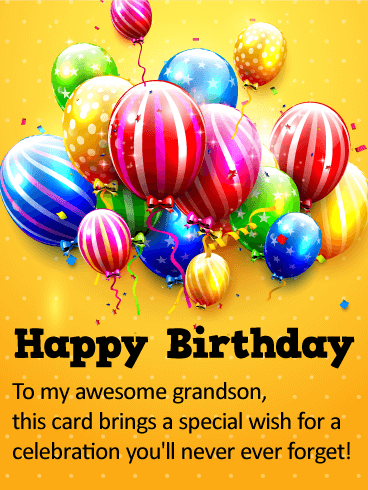 Do not forget to send him this birthday card today to put a smile on his face!